So often we hear from couples we counsel that they just don't know their roles as husband and wife. With society screaming so loudly that women can bring home the bacon, fry it up in a pan, the steady, solid, biblical truth of who women are created to be as wives often gets put aside as we reach for the 'more' of the world...leaving us exhausted and frustrated. Chapter 13 of The Surrendered Wife, Abandon the Myth of Equality, author Laura Doyle speaks to gender blender society has created and how contrary it is to roles in marriage. God created men and women equal in their relationship to Christ, yet with separate distinct roles in marriage for a man and a woman, a husband and a wife, intentionally and purposefully. 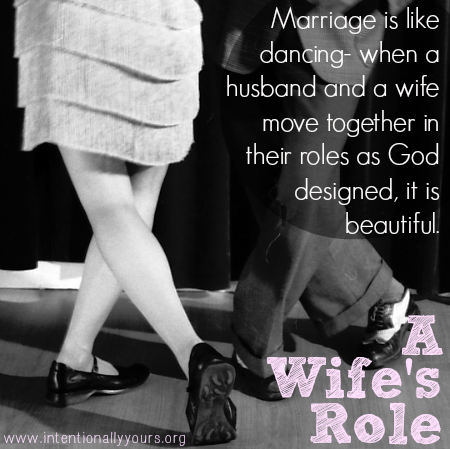 Marriage is like dancing- when a husband and a wife move together in their roles as God designed, it is beautiful. Can you imagine what Fred and Ginger would have looked like if they both tried to do the same role in their dancing? It would have been a mess. As women, God intentionally and wonderfully created us to reflect His beauty in a way that nothing else on the planet can. Society tramples that beauty, telling us that it is not enough, redefining an unattainable false beauty. Knowing and understanding who we are as women is paramount. Before you took on the role of wife, you were created as woman. Do you know the desire God placed in your heart? What does that mean in the context of being a wife? It's okay (and necessary!) to embrace our design as the weaker vessel as indicated in 1 Peter 3:7, Likewise, husbands, live with your wives in an understanding way, showing honor to the woman as the weaker vessel, since they are heirs with you of the grace of life, so that your prayers may not be hindered. Our design was to perfectly mesh with the design of our husbands- to pursue, protect, love and value their wives. The 50/50 plans for marriage don't work. You know what I mean...I'll do my half, you do yours. In marriage, the plan is for each of us to give 100%, otherwise we're measuring the efforts of your spouse, letting him know when he measures up to what you see as his 50%. And honestly, in this system, don't you always feel you've given your 50% long before your spouse? When you got married, you accepted the role and responsibility of wife. Do you know what that means? The role of the wife is to help, respect, love and to submit to your husband, which God designed intentionally to work well with your husband's role to lead, love, and serve his wife. What does that look like in the practical day to day? Praying about your strengths and your husband's strengths, and determining who does what around the house based on those strengths and desires. I don't mind cleaning bathrooms, but Scott decided long ago that the responsibility of cleaning the bathrooms in our house would be his and our son's. I didn't argue! Talk with your husband about the division of labor in your house...with grace. But at the end of the day, keep in mind, that only one of you was designed to lead in your marriage, and it's not you. There is freedom in clearly understanding your role, because you can play all the way to the fences. Let me explain...a study was done on playgrounds and how children play. Children playing on a playground without a fence stayed closer to the building, citing it felt safer. Children playing on a playground with a fence, utilized every inch of the fenced area because they felt safe. Roles provide that same sense of safety and freedom to be all God created us to be. Seek God's role for you as wife. PERSONAL NOTE: One thing I want to mention here is that yes, I am disappointed that with all God has to say about the role of wives and submission, the author doesn't cite any scripture, yet manages to quote Buddha. It's still a great book, it still lines up with God's Word, the author's frankness was a practical wake up call for me...I just wish she'd embrace and share that God is the author of surrender. In case you've missed it, this post is part of a series following along with The Surrendered Wife. I'd strongly encourage you to pick up the book and read along! Catch up on the blog series now by reading: Control or Intimacy, Did You Marry a Loser?, Chauffeur or VIP, Shhhh!, Crazy Resentful, Your Heart's Desire, You Bought a What? !, Just Say Thank You, Girlfriends, Button Pusher, and Expectations.